Available in 8 versions form the entry level Golf Estate S to the practical yet exciting sports edition the Golf Estate R which can go from 0-62mph in a staggering 5.1 seconds. 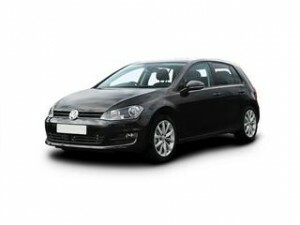 The Golf Estate Bluemotion version can return up to 80.7mpg if you’re looking for economical performance. The interior is well laid out with the focal point being the central touchscreen console. There’s plenty of legroom and headroom for both driver and passenger alike and the small touches such as the cup holders make a real difference. The panoramic sunroof optional extra is one extra that really sets the car apart from the rest. The ample boot space is a massive 605 litres and with the seats down this increases to a staggering 1,620 litres of space. Enough for most situations. The roof rails allow for even further luggage space or bikes should you need more, a handy touch indeed. Owning your own Volkswagen Golf Estate could be easier than you think. Don’t pay direct dealers list price you could save thousands using Coast2Coast Cars offers search system. We scour the dealers for the best offers on your next new car. Our service is free and with no obligation. See how much you could save today.